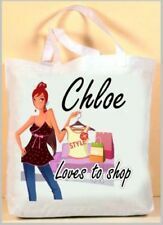 This Love Is In The Air Tote Bag is ideal for adding a little bit of love to your style and wardrobe. Featuring a cute print of the iconic Radley Scottie dog and a Paper Airplane. Crafted from textured canvas. Radley Folder Up Shopper Tote Cotton Canvas Bag - Cream - Dark/Red Scottie Dogs. Condition is excellent condition as new. RADLEY TOTE BAG. IT'S PLANE SAILING. RADLEY DOG CANVAS TOTE BAG White. Condition is New with tags. Dispatched with Royal Mail 2nd Class. Radley Shopper Bag. Condition is New with tags. Dispatched with Royal Mail 2nd Class, sign for. Brand new and in excellent condition. It is a small/medium size. Thank you for looking. Lovely White Cotton Tote/Shoulder/Shopper bag from the Radley Doidle Dog collection featuring an array of pastel coloured Radleys to the front and Radley Lindon leather tab to the back. Inside there is a handy Cotton zipped pocket with the Radley London name printed in Black. These are great bags to have folded away so never caught out without a bag when shopping or having to pay for a plastic bag! Great also as a School/College bag to get all those papers and books in. Little used so in lovely condition with only the odd very minor use mark if being critical but no damage and no stains to either the inside or outside. Has Inner zipped pocket with RADLEY logo. Plain sailing design.exclusive design. This is a really Handy travel bag, or beach bag. Small zip pocket inside for your valuables. 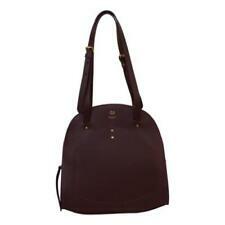 This is a great bag from Radley with a large center pocket, 2 zipped pockets on the inside and 2 outer pockets. This item has been kindly donated to raise funds for St Helena. Help us to continue supporting families and their loved ones by favouriting usHERE. Lovely soft leather Tula handbag with floral lining. Bag has an interal zip pocket and rear external zip pocket and 2 front pouch type pockets. Reflection makes it look to have white patches but this is simply the light. Beautiful bag in mint new condition. Classical Elegance. Radley Tiki Hand Bag GC (S/M) RRP£140 BfUnKy4LeSs! From BfUnKy4LeSs! Simply elegant leather Radley Tiki 'doctors' hand bag. Used and enjoyed so therefore this bag is not new or perfect. There is a small mark shown in the photos and further light signs of usage but the interior is clean and it still looks lovely. Classical Elegance. Radley Tiki Hand Bag Hardly Used! (S/M) RRP£140 BfUnKy4LeSs! From BfUnKy4LeSs! Simply elegant leather Radley Tiki 'doctors' hand bag. SO YOU REALLY CAN We are experienced at spotting fake Radleys. We have not sold a fake yet. • Stuffed to protect leather and bag shape. Off white leather small tote bag, internal zip pocket, 2 internal slip pockets ?. Strap 11 1/2" 13 1/2" 4 1/4". 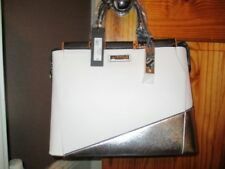 RADLEY FITZROVIA IVORY LEATHER HANDBAG TOTE SHOULDER BAG NEW!!! RADLEY FITZROVIA IVORY LEATHER. Inside, the bag is fully lined in a Radley Scottie dog jacquard fabric. The inside features a zip fastening pocket and two open pockets. HANDBAG TOTE SHOULDER BAG. AND THE CONDITION OF THE BAG. 2 Radley canvas totes. New unused. 1 has marks on bottom corner as pictured. Union Jack design, branded on reverse. Each bag has a brass plate inside engraved with the number of the bag. This is number 465 of 500. Bag was done as part of a campaign and has 2 leather slip pockets each with reference to Radley’s ethos on bags. Radley Signature/Picture Bag & Coin Purse - 'Dog Of The Manor' - NEW. External Features: The bag has a zip fastening. Grab handles and longer detachable and adjustable shoulder strap. Slip pocket on the back of the bag. Lovely textured ivory leather with smooth leather inserts. Contrasting clover pink stitching and stripped lining. Magnetic closure. Contrasting feet. Width approx 7 but opens to approx 10 in. This is a lovely Radley tote bag. It is called Columbia Road and comes with handy, zipped inside pocket. I will be listing other Radley bags if you have the time to look and will always reduce the P&P when 2 or more items are purchased. Thank you for looking today. Brand new with zipped purse holder Bargain!! Radley Canvas Tote Bag Spots And Stripes - New With Tags. Condition is New with tags. Dispatched with Royal Mail 2nd Class. RADLEY ‘Plain Sailing’ 2 Canvas Totes / Shopper Beach Travel Bag. Condition is New with tags. Dispatched with Royal Mail 2nd Class. GENUINE RADLEY LONDON. NATURAL / CREAM COLOUR BACKGROUND WITH RADLEY DOGS PRINT. Grey Press Stud Fastening with RADLEY Dog in White. Navy & white leather Radley dog. Deep zipped wall pocket & 2 slip pockets inside. Unopened and sealed in plastic bag. Outer slip pocket. GENUINE RADLEY LONDON. NATURAL ECRU COLOUR CANVAS WITH RADLEY DOG OUTLINE & FLORAL PRINT. Eye-Catching Outline Print of Much Loved RADLEY Dog with Hand-Drawn Effect Floral Print Within - Coral / Pale Lemon & Dark Grey Colours. Gorgeous white leather Radley bag with pink bottom. Detachable strap. Length 12", Height 8". A dreamy design that Radley fans will love! Featuring a playful print, we see little Radley ready for take off on this canvas tote. 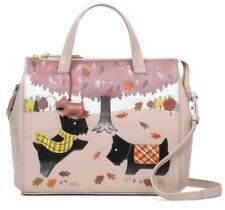 - Playful Radley print in Taupe & Pink. This bag is perfect for travel /commuting to and from work (and for picking up those extra bits and pieces along the way!). IT HAS A CREAM BACKGROUND WITH THE HEARTS AND DOTS IN PURPLE. THE RADLEY DOGS ARE A PINK / CORAL COLOUR AND A TURQUOISE OUTLINE RADLEY DOG. 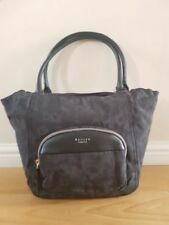 RADLEY LOVELY HIBBERT BAG. THE RADLEY DOG IS PINK/CORAL COLOUR. 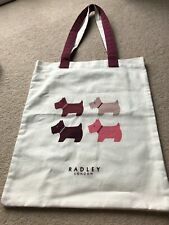 New Radley Folder Up Shopper Tote Cotton Canvas Bag - Scottie Dog . Condition is New with tags. Never used unwanted gift. Excellent condition. And of course Radley dog. also Radley London signature ❤️. Radley canvas tote. 14" x 16". plane sailing design. features paper boats and planes. Interior zippered pocket for safety. This is a limited edition print bag designed for sale in airports or on board a plane. has attractive pattern to front of paper planes and Scotty dogs', the back is plain but says 'Radley London' towards the bottom. Brand new Radley Canvas Tote Shopper Bag kites, planes Cream Medium/large size Double strap, inner zipped pocket Measures 35cm width 40cm height New with tags P &P by Royal Mail 2nd the next working day after payment received. Uk bidders only. Payment via PayPal please. A really unusual and rare Radley tote. Cream with silver spots and Black Radley dog.